As I have said before, I am not a huge fan of Dr. Seuss. While I recognize the value of rhyming for early literacy, the excessive silliness is lost on me. That being said, I enjoyed Seuss’ McElligot’s Pool, a 1948 Caldecott Honor book. The story starts when a boy starts fishing in a small pond, but is soon informed by a farmer that no fish live there, but that he might catch some trash. The boy then wonders if the pond might be connected to an underground brook, and the story becomes fantastical as he imagines where this waterway might lead and what creatures might be living there. Yes, the made up fish are silly, but the illustrations of all of this implausible sea life certainly made me laugh. 1. “Excellence of execution in the artistic technique employed.” – These pictures are typical for Dr. Seuss. I do not consider them technically excellent, but they are detailed and spark the imagination. 2. “Excellence of pictorial interpretation of story, theme, or concept.” – YES! I am not sure if the Eskimo Fish swimming in parkas or the comparison of a Sea Horse to a cow fish made me laugh more. 3. “Appropriateness of style of illustration to the story, theme or concept.”- For this story’s intent of helping children think about the real meaning of words in a comical way, its style of illustration is effective. 4. “Delineation of plot, theme, characters, setting, mood or information through the pictures.” – The plot is easy to follow and each character is very clear. 5. “Excellence of presentation in recognition of a child audience.” – While more colorful pages would possibly help to visually attract children, we all enjoyed this book. 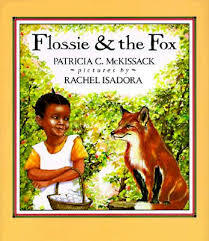 Flossie and the Fox by Patricia C. McKissack relates the story of a little girl who tricks a sly fox so that she can safely deliver eggs across a forest. After being sent away with the load of eggs by her grandmother who warns her about the fox, Flossie encounters the wily creature. In order to avoid his tricks, the girl says she refuses to believe that he is a fox. As she makes her way through the woods, she insists instead that the fox must be a rabbit, a cat, and a squirrel based on the characteristics that the fox points out. Just as he points out that he has sharp teeth and can run fast and THAT must mean he is a fox, Flossie reaches the end of her journey, and dogs chase off the befuddled animal. On the last page, the reader learns that Flossie knows the true identity of the fox all along, but her game has allowed her to outsmart the animal and safely deliver her grandmother’s farm goods. Pros: A fun book to teach using reasoning and sequential thinking. Cons: While I liked the use of African American language typical of the Southern United States, it did bother me that its use was not consistent. 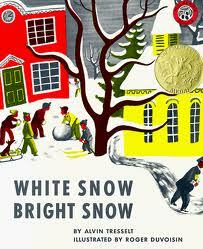 White Snow Bright Snow, written by Alvin Tesselt and illustrated by Roger Duvoisin, received the 1948 Caldecott Medal Book. Before the snow begins to fall, the reader meets the postman, the farmer, the policemen, and the wife of the policemen. We watch how they prepare for the inclement weather, survive through the storm, and finally enjoy the outdoors as Spring begins to arrive. 1. “Excellence of execution in the artistic technique employed.” – These simple illustrations utilize grey tones with accents in reds and yellows to accentuate the white of the snowy scenes. While not detailed, these pictures help the reader feel at home in the town. 2. “Excellence of pictorial interpretation of story, theme, or concept.” – Each picture captures the words in the story well. 3. “Appropriateness of style of illustration to the story, theme or concept.”- Roger Duvoiosin’s folk art style helps this story set in a small town seem real. 4. “Delineation of plot, theme, characters, setting, mood or information through the pictures.” – The plot, theme, characters, setting, and information are very clear. The mood changes throughout could have been more obvious. 5. “Excellence of presentation in recognition of a child audience.” – My children and I all enjoyed reading this book during one of our own blustery snow days. Song of Robin Hood, selected and edited by Anne Malcolmson, with music arranged by Grace Castagnetta, and designed and illustrated by Virginia Lee Burton, received a Caldecott Honor award in 1948. The fifteen original ballads of Robin Hood are presented in this book with modern musical notation and detailed drawings. 1. “Excellence of execution in the artistic technique employed.” – These black ink drawings are amazingly detailed. Each 4-lined stanza has its own small descriptive picture. If you look down through each of these illustrations it is almost like a slow-moving cartoon. 2. “Excellence of pictorial interpretation of story, theme, or concept.” – The story is easily understood with the tiny pictures to the side of each stanza, but readers should come armed with a magnifying glass. 3. “Appropriateness of style of illustration to the story, theme or concept.”- The drawings do have a very medieval look. 4. “Delineation of plot, theme, characters, setting, mood or information through the pictures.” – The illustrations closely adhere to the plot and information given in the story. The overall theme,however, seems to get lost. The characters, though present, lack a sense of personhood and, thus, are not easy to identify with. 5. “Excellence of presentation in recognition of a child audience.” – Although the stories are good and the illustrations are incredible, I found this book difficult to read to my children. 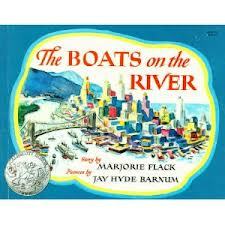 Such tiny pictures made reading this book to a group of children, even just my two big girls, nearly impossible.